Parliament unanimously agreed to pass a bill to amend the Income Tax Act today. 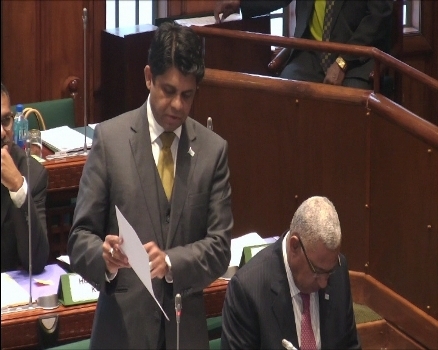 Minister for Finance Aiyaz Sayed-Khaiyum says the amendment to the act is to cater for a number of reasons; the first being that private sector organisations that contributed to team Fiji’s participation at the Pacific Games were promised tax deductions. Sayed-Khaiyum says it also makes sure that the Fiji Rugby Union will be able to source sponsorship from private sector organisations to help them prepare for the World Cup in the UK in September. He also says the amendment would seek to address the lifting of the cap from twenty-five million to 60 million dollars for movie production and the rebate that’s available. This decision will in turn attract a major production to Fiji. MP Aseri Radrodro asked for other sports to be added to the list. However, Sayed-Khaiyum says it is only for specific events such as the Pacific Games and the World Cup.